Ashwin Sanghi, in his book Chanakya's Chant, takes you on a page-turning ride alternating between 320 BCE and the 'present day'. The Machiavellian efforts of Chanakya to unify the Indian sub-continent under Chandragupta is described in fictionally authentic detail, blurring the difference between fact and imagination in the reader's mind. Chanakya's dedication to the cause of unifying the sub-continent lead him to using his sweet-heart as a pawn on his chessboard. Even as a concubine to his enemies, Suvasini prayed to Shiva for his success but later cursed him a future without a lineage and his knowledge of crafty statesmanship without any application - unless thousands of years later someone meditated on a mantra to be able to apply this knowledge. A stone tablet containing the mantra, to revive Chanakya's statesmanship, is discovered by Gangasagar.The Chanakya-esque Pandit Gangasagar Mishra attempts to unify India under the Prime Minister-ship of Chandini Gupta. Chankya's crafty statesmanship is revived by Gangasagar Mishra to attain his objective at any cost. The racy 'present day' narrative has the hijack of flight IC-617 which closely tallies with that of the hijack of IC-814 on the 24th December,1999. Ashwin Sanghi has blended fact and fiction so well that it makes one wonder if the rest of the fiction of the hijack has its moorings in real life. The Goebbelsian fixing of opinion polls by Gangasagar Mishra makes you wonder how much of what you are told, hear or read, everyday, is part of propaganda. The realistically fictionalized description of the functioning of RAW, the Intelligence Bureau and allied government agencies shows the ill-intentions of the elected representatives of the people. The author insight-fully covers present day business, bureaucracy and politics showing how servile, sinister and self-seeking the business of governance is. Statecraft, about 2,300 years back, it appears, was even more sinister and dangerous when kingdoms battled without much thought about death and destruction. Honey traps in Chanakya's era were not just about pretty women. These women (Vishkanyas) were raised on deadly poisons which made them immune to even snake bites. Even the smallest exchange of bodily fluids with another lead to instant death - which was used, by Chanakya, to eliminate powerful kings in order to bring the subcontinent under the unified rule of Chandragupta. History tell us the Chanakya succeeded in uniting most of the sub-continent under Chandragupta Maurya. Chandragupta was the first unifier of India and its first real emperor. He achieved this when he was only about 20 years old - which would not have been possible without the crafty guidance of Chanakya. Pandit Gangasagar Mishra seeks to achieve the same with Chandini Gupta -without venomous Vishkanyas or wars. If only Pandit Gangasagar Mishra were as real as Chanakya. 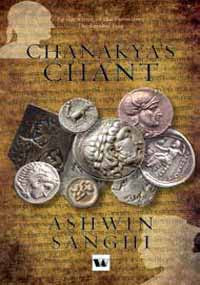 Chanakya's Chant by Ashwin Sanghi. this story seems so convulted I wasn't sure if it was real or not! Wasn't Chanakya a general of some sort? Chanakya was a minister in the court of Emperor Chandragupata. Great review - makes me want to read the book!